Over the next few days, FiveThirtyEight will be examining each of the eight groups in the 2018 World Cup, which begins June 14 in Russia. Read about Group A here. Group B features what could have been one of the World Cup’s unexpected teams to watch in Morocco, whose 72.3 rating in FiveThirtyEight’s Soccer Power Index places the Lions of the Atlas as the 18th best in the world, tops among all teams from Africa and ahead of more touted underdogs like Iceland and Peru. In Group A, Morocco would be the story. But an unfortunate draw matched it with defending Euro champion Portugal and perennial power Spain. While Spain has struggled internationally since its run of three consecutive major tournament trophies from 2008 to 2012, the team’s numbers have never been less than excellent. Julen Lopetegui’s side once again romped through qualifying with nine wins in 10 matches and only three goals conceded. SPI rates Spain as the second-best side in the world, with a 17 percent chance of winning its second World Cup. Spain, perhaps more than any other national team, has an established identity. Despite turning over nearly all of its attacking and midfield players since 2010 — only Sergio Busquets remains in the same role he played on the team that beat the Netherlands in that final — Spain has maintained the same probing, passing style. No team in the world has depended less on crosses to move the ball into the penalty area. Since the last World Cup, in matches tracked by analytics firm Opta Sports, just 10 percent of Spain’s successful passes into the penalty area have been crosses, the lowest percentage of any team in the world with 10 or more matches tracked in that time. To attack this way requires Spain to push most of its team forward, often getting eight players including the fullbacks near the penalty area. This could open Spain up to counterattacks. But it snuffs out these opposition attacks by “counterpressing,” a tactic where Spain responds to loss of possession by immediately springing a series of defensive traps before the opposing team has an opportunity to get its attack set. Spain wins the ball in the opposition half after breaking up a new opposition possession more than 14 times per match — most in the world. When its attacks break down, Lopetegui’s side springs into action and stifles any possible counterattack before it can develop. The whole package is there for a Spanish World Cup. Although it won the Euros in 2016 and breezed through its qualifying group, Portugal often seems like an afterthought. Cristiano Ronaldo at 33 is a pure penalty box striker rather than the dynamic hybrid wing he used to be, and none of the young players has made the leap to stardom. But Portugal keeps plugging along with simple, perhaps uninspiring tactics that nonetheless maximize Ronaldo’s shooting opportunities. Rather than taking the deep-possession risks that Spain does, Portugal gets the ball wide and crosses in more than almost any other top team. While its Euro run was unlikely — and required serious luck in the draw to get Wales in the semifinal — Portugal does not look likely to collapse before the knockouts. This is especially bad news for Iran, which is stuck with a mere 18 percent chance of reaching the knockouts. Iran has a clear plan. In its few matches tracked by Opta, Team Melli did not once move into the penalty area through a long string of passes. Instead, Iran’s strategy will be sitting deep, defending and looking for one or two opportunities. This is a proven tactic in international tournaments, and Iran could steal a result, but with opposition this strong, it’s unlikely to lead to a knockout appearance. The strength of Spain and Portugal makes it hard to pick Morocco, which is an entertaining team with a reasonably impressive record. Manager Herve Renard has his team playing not unlike Portugal, with an aggressive high press and an attack that doesn’t try anything fancy but gets the ball into the penalty area. But even if Morocco can’t edge out one of Group B’s European powers, its matches are worth checking out to see one of the most fascinating players in the tournament. Everything Morocco does runs through Hakim Ziyech. The 25-year-old midfielder is one of the premier ballplayers in the world, in the sense that he is constantly playing the ball. In both of his past two seasons for Ajax, Ziyech has led the Dutch league Eredivisie in both shot attempts and shot assists. He creates a ton of opportunities for his teammates, but he also ends innumerable possessions with his willingness to shoot from literally anywhere. 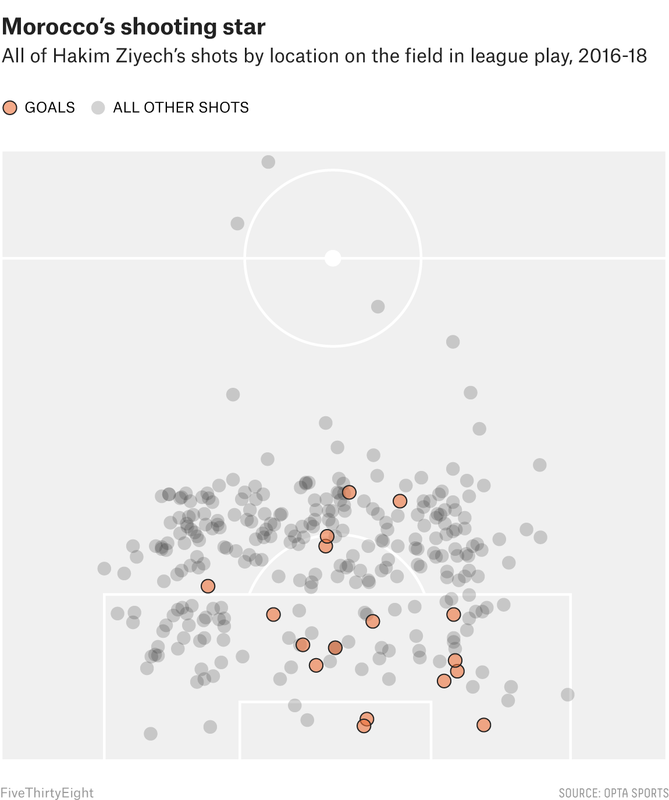 Excluding direct free kicks, Ziyech has taken 202 shots from outside the box in the past two seasons — lapping the field among players in the big five leagues and the Eredivisie. Lorenzo Insigne is second with just 156. Ziyech’s shots are worth visualizing. In a group like this, where Morocco will probably need a little bit of luck to get through, Ziyech’s creativity and free-shooting ways will at least give his team a roll of the dice against Spain and Portugal.